With this year being the first where Bubs is actually aware of, and inordinately excited about, Christmas we have decided to go all out on the decorating front. 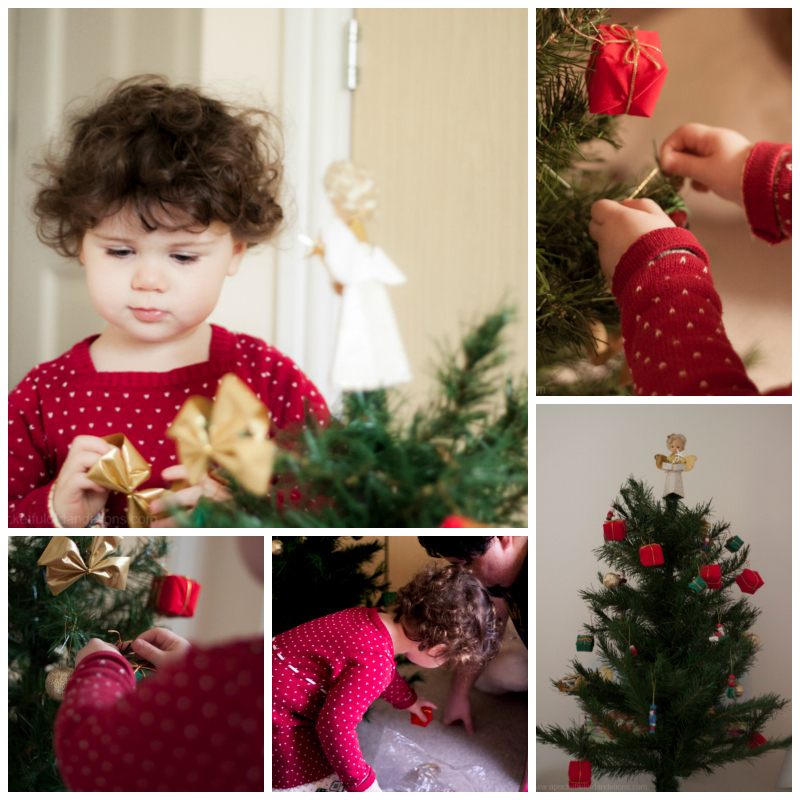 There are fairy lights and tinsel draped over every available surface and this year Bubs (with the help of Hubs) was allowed to decorate her very own Christmas tree for her bedroom. We then turned our attention to our family tree. It took me most of Monday to put the tree together (I’m a bit fussy and like the branches to look ‘natural’) and then on Tuesday Bubs helped me to decorate it. I was expecting it to be a stressful experience as Bubs is still a little fractious at the moment but actually it was loads of fun. We put on some cheesy Christmas music and bopped around the room in-between adding things to the tree. When I was little our family Christmas tree had lots of wooden toy decorations on it and my love for them started then. I’ve collected quite an assortment over the years (eBay is a great place to find them), along with some fabric decorations that I made myself. Then there are the decorations that have sentimental value, like the one we bought when Hubs and I moved in to our first home together and the metal decorations Hubs brought home from his conference trip to the States just after we got engaged. We’ve never had a real tree at Christmas and now that we’ve got three dogs it’s probably not a good idea to bring a glorified weeing post into the house! My mum-in-law used to have a real tree though and she misses the smell of them now that she has an artificial one. When I spotted this candle in HomeSense last year I just had to have it. I’ve tried a few WoodWick candles (HomeSense seems to always have them on offer) and they smell wonderful. This one is no different and does have a gorgeous ‘wintery forest’ scent. Sadly it’s not available any more so we’re going to have to savour it. Every year I have a tradition of either buying or making a new decoration to add to the tree. This year I’ve decided to mix the two and have bought a couple of sew your own decoration kits. Because I’ve never been one to follow directions to the letter, and I believe that everything can be made better with the addition of buttons and ric-rac, I’ve embellished him a teeny bit. I’ve another two (Santa Claus this time) to make and maybe one of these days I’ll finally get around to making the Posy Gets Cozy ~ Snow Day ornaments that have languished in my to-do pile for two years! Thanks Katy! I can’t be doing with the whole ‘twig with baubles on’ thing that’s been popular the last few years. Mr. “A” – There are some things even I can’t do, but wait!!! In one year when your contract is up at that time I bet you can upgrade to a 4G phone. See wasn’t that easy? I should start an advice column!!!! Thanks for regnadi….. Mr. “A”. Thanks Louise. 🙂 The dress was a lucky find in TK Maxx last month. It’s a gorgeous tree – your halls look very merry and bright! And yes, you have to do the Snow Day ornaments, they’re so cute – and one of the two sets that I’ve actually completed – the rest are lined up waiting for the mythical ‘more time’ time! I’m itching to start making them as I just love the red coat!